It’s finally out! 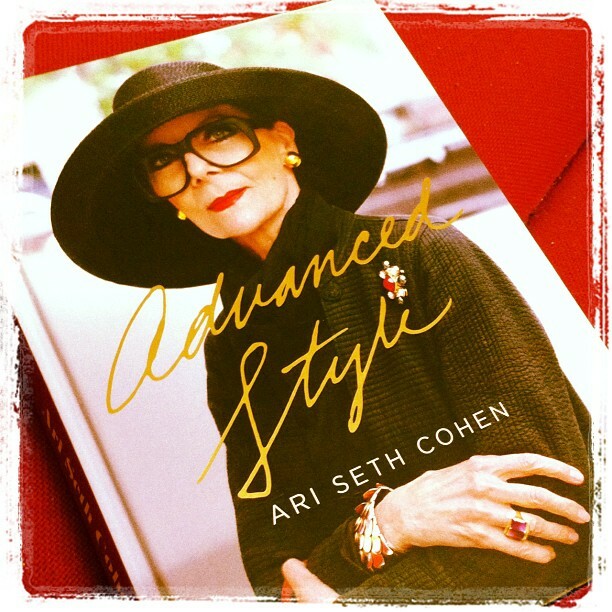 The fantastic book of Ari Seth Cohen which celebrates the exquisite style of women over 60, 70, 80, 90 and even 100 years old. I managed to get hold of (appearantly) the last book available in the whole of Amsterdam. Pity as I had planned to buy 3 copies, 1 for my mother, mother in law and of course, myself. Still it’s a great sign that there is definitely a market for a book like this, which I find very encouraging. As you may know Ari Seth Cohen started his site Advanced Style a few years ago. Inspired by his stylish grandmother, he roamed the streets of New York in search of stylish ladies over 50. In the process he discovered many beautiful and inspiring women such as 100 years old Rose, the colourful and excentric pair of Carol markel & Richard Cramer, west village author Alice Carey, Debra Rapoport, artist Ilona royce Smithkin, artist and writer Beatrix Ost, 80 year old Joyce, Linda, Lubi, 100 year old Ruth, glamorous Lynn Dell, Mary, Tziporah Salamon, Maryann, Jacquie Tajah Murdoch, the Idiosyncratic Fashionistas and many others. All of the above ladies get a small introduction and provide some insights on style. Many other women’s photographs are featured throughout the book and my absolute favorite is of course Judith Boyd, aka The Style Crone, whom I so much admire. She looks absolutely fabulous in her long beautiful coloured coat. The book is fabulous. The photos are superb and the ladies (and a few men) all unique and stylish in their own way. Text is kept to a minimum and the photos do all the talking. This book will provide endless inspiration for your style as well as new outfit ideas. It will also inspire you to approach aging with applomb and enthusiasm. Advanced Style shows like no other book that life at old age can still be as stylish, colourful and joyful as ever! Advanced Style is available at Amazon. Enjoy! Have you seen the book yet? What did you think of it? Totally agree Rachel. It’s worth just buying the book, putting it on your coffee table and make lots of people happy or inspire them. Like no other book it shows that life does not stop at 60! I have not bought or read the book. As I like Advanced Style a lot, I will order it through a very nice, old and good bookshop here in Haarlem. Befitting for such a book. Next post: Dressing up for Madonna in Amsterdam!